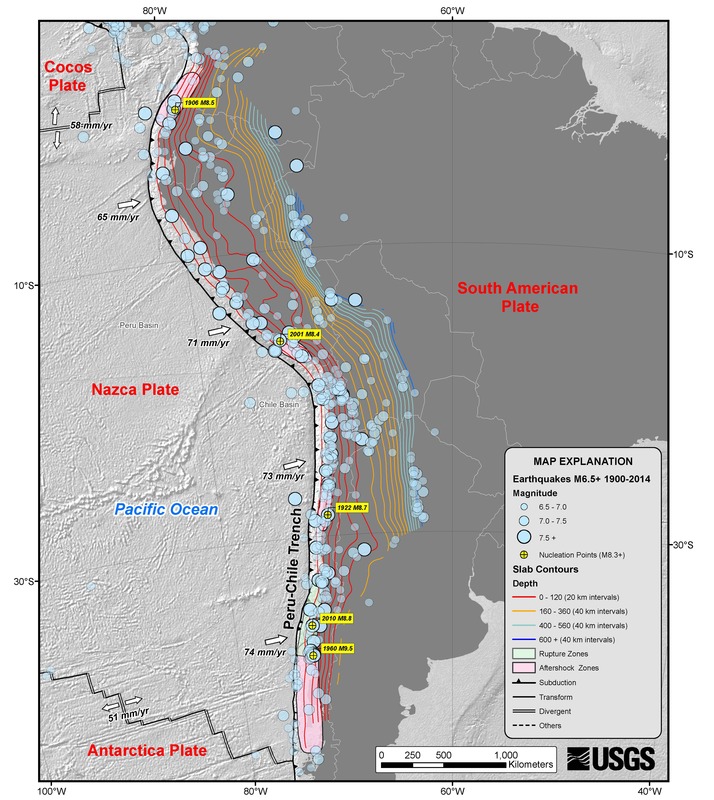 The April 16, 2016 M 7.8 earthquake, offshore of the west coast of northern Ecuador, occurred as the result of shallow thrust faulting on or near the plate boundary between the Nazca and South America plates. At the location of the earthquake, the Nazca plate subducts eastward beneath the South America plate at a velocity of 61 mm/yr. The location and mechanism of the earthquake are consistent with slip on the primary plate boundary interface, or megathrust, between these two major plates. Subduction along the Ecuador Trench to the west of Ecuador, and the Peru-Chile Trench further south, has led to uplift of the Andes mountain range and has produced some of the largest earthquakes in the world, including the largest earthquake on record, the 1960 M 9.5 earthquake in southern Chile. Ecuador has a history of large subduction zone related earthquakes. Seven magnitude 7 or greater earthquakes have occurred within 250 km of this event since 1900. On May 14th, 1942, a M 7.8 earthquake occurred 43 km south of this April 16th, 2016 event. On January 31st, 1906 a M 8.3 earthquake (reportedly as large as M 8.8 in some sources) nucleated on the subduction zone interface 90 km to the northeast of the April 2016 event, and ruptured over a length of approximately 400-500 km, resulting in a damaging tsunami that caused in the region of 500-1,500 fatalities. The April 2016 earthquake is at the southern end of the approximate rupture area of the 1906 event. A shallow, upper crustal M 7.2 earthquake 240 km east of the April 2016 event on March 6th, 1987 resulted in approximately 1,000 fatalities.